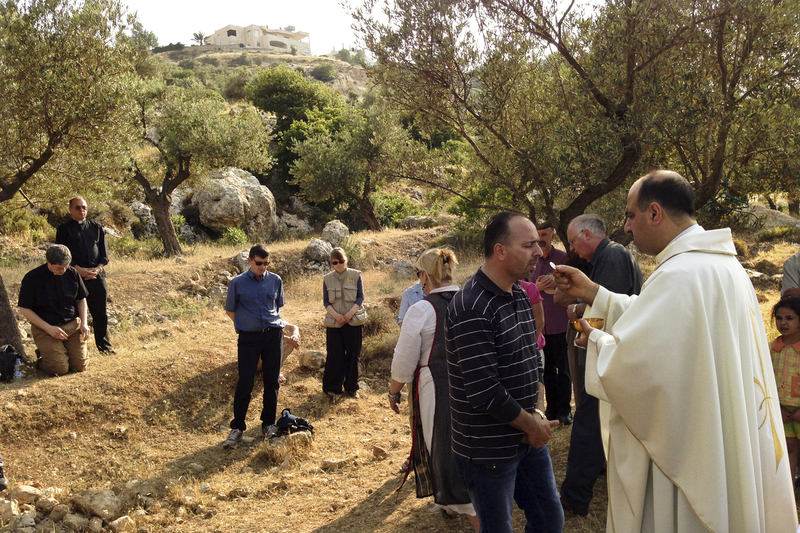 Ibrahim Shomali, a Palestinian priest, offers Communion under the olive trees of the Cremisan Valley in the Israeli-occupied West Bank. This is part of a regular protest against Israeli plans to build a section of its West Bank barrier here, which would separate Palestinians from their agricultural lands. Israeli army Capt. Barak Raz climbs a metal staircase to the top of a high concrete wall that is part of Israel's West Bank barrier. From his perch, he overlooks both the Palestinian village of Bil'in and Modin Illit, the largest Jewish settlement in the West Bank, with some 50,000 residents. The barrier here used to be a fence. After many confrontations with Israeli soldiers, Palestinian villagers won a court case, and the fence was moved off some of their land. But since the barrier was moved closer to an Israeli settlement, it was rebuilt as a wall. "We can certainly see the security fence has huge benefits. Controversial as it may be, no one can argue with the statistics that it simply brought an end to that free flow of terrorism," says Raz. Israel's barrier has been a source of international criticism, United Nations resolutions and legal cases at the International Court of Justice. It has sparked countless confrontations between Palestinians and the Israeli security forces. In this area, Bil'in was featured in the Oscar-nominated documentary Five Broken Cameras, which looked at the barrier through Palestinian eyes. Israeli army Capt. 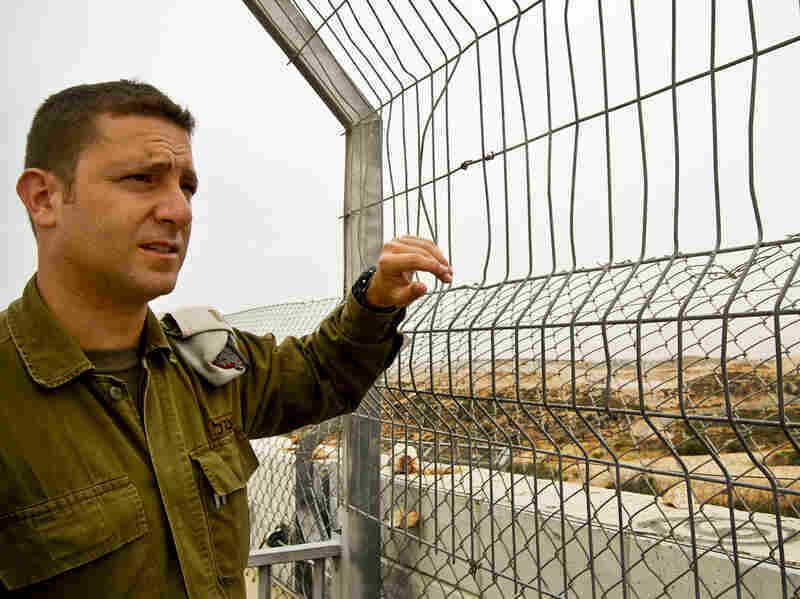 Barak Raz stands on a concrete wall that is part of the barrier separating Israelis and Palestinians in the West Bank. Soldiers climb to this spot during Palestinian protests to disperse crowds with tear gas or a foul-smelling liquid nicknamed "skunk." Israel started constructing the barrier in 2002, at the height of the Palestinian uprising that began two years earlier. More than 400 Israelis were killed in Palestinian attacks that year, and Israelis say the barrier was one of the main reasons that Palestinian attacks dropped off sharply in the years that followed. But the Palestinians don't agree. They still see the barrier as an Israeli attempt to take West Bank land that the Palestinians want for a future state. "When they say this wall is providing security, it's not true," says Mustafa Barghouti, a Palestinian political leader. "There are no bombings because Palestinians have chosen a different path. There is a decision to not do military actions, to stick to nonviolence, and the wall is not effective from a military perspective. The proof to that is today I managed to cross and penetrate the wall and go to Jerusalem, and they couldn't stop me." 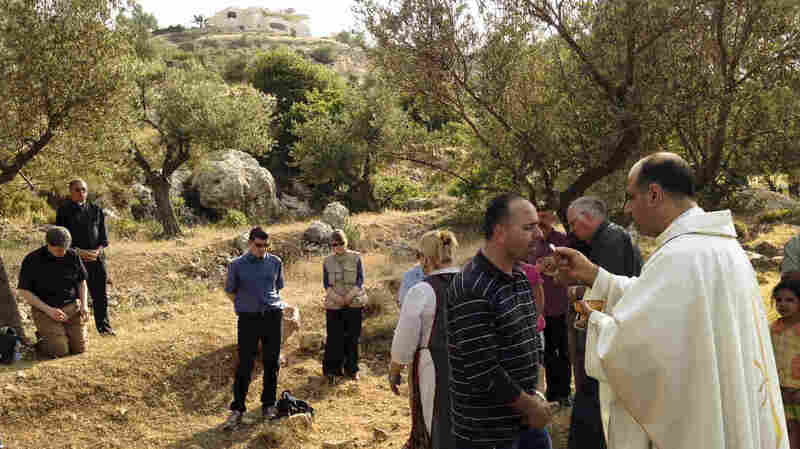 Barghouti is attending a regular protest in a valley near Bethlehem where the wall, as currently planned, would separate Palestinians from their agricultural land. The cleric leading the service calls it an "apartheid wall." Palestinian political analyst Asa'd Ewaiwi says that because the barrier shrinks the land Palestinians have access to, it makes peace talks with Israel impossible. "It actually destroys the option of negotiations. This is a political wall rather than a security wall, as claimed by the Israelis. It destroys also the option of a two-state solution," he says. Israeli professor Efraim Inbar argues the opposite. "I think that the Arabs should be happy that we built a fence because it marks a potential border," he says. "In my view it solidifies Israel's willingness for partition of the land of Israel." The barrier stretches for some 400 miles, much of it on or near the boundary separating Israel and the West Bank. But in a number of places it goes deep inside the West Bank. The barrier's route puts around 10 percent of the West Bank on the Israeli side, according to the Israeli human rights group B'Tselem and other organizations that have closely monitored its construction. Some parts of the barrier resemble a border between two countries already. And, like most any border, it isn't completely impenetrable. Israeli security officials point to a bus bombing in Tel Aviv last November as a prime example. 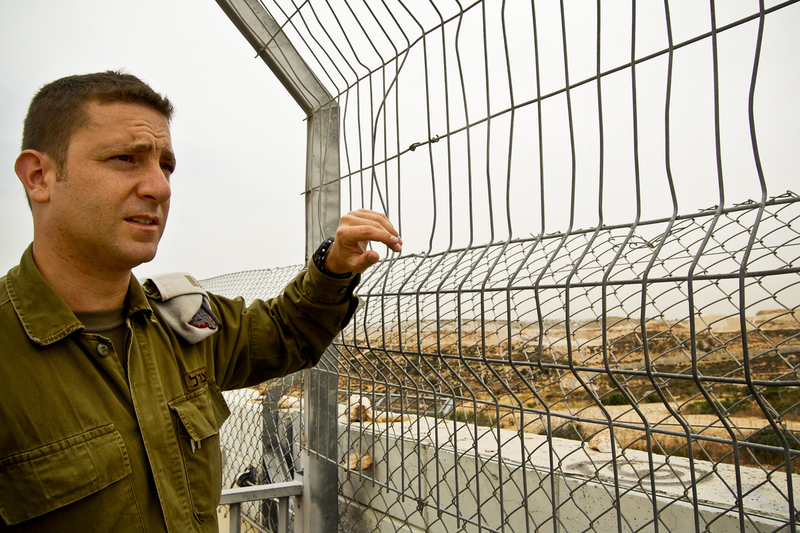 Still, the fence-and-wall combination has brought a sense of protection to many Israelis, says Shlomo Brom, with the Institute for National Security Studies at Tel Aviv University. He says that might help — or might hurt — negotiations. "On the one hand, you need security and no terrorist actions to enable real negotiations," Brom says. "But on the other hand, if everything is quiet and secure, there is no real pressure on Israel to do anything." U.S. Secretary of State John Kerry, who arrives in the region on Thursday, will be traveling through the barrier as he shuttles between visits with Israeli and Palestinian leaders in an attempt to get the two sides back to the negotiating table.